Hi, my name is Samantha Newman and I am a sixth form student at George Abbot School in Surrey. I am studying biology, geography and psychology and hope to do geography at university. 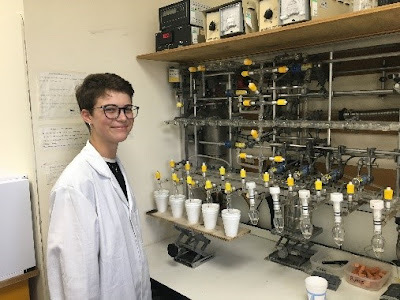 I travelled all the way up to Keyworth in Nottingham to take part in a work experience week at the British Geological Survey, in their Stable Isotope Facility (SIF). I worked with their geoscientists and learnt about how isotopes play a key role in reconstructing past climate conditions measuring oxygen, carbon and nitrogen isotopes from a variety of materials. At the start of the week, I was given a tour of all the stable isotope labs with a quick description of what each of the mass spectrometers are used for – to say the least it was a lot of information to take in at once! There are so many different mass spectrometers in the SIF – they can measure isotopes in methane, organic and inorganic carbonates, and within water, plants, soil, proteins, bones, teeth and hair. 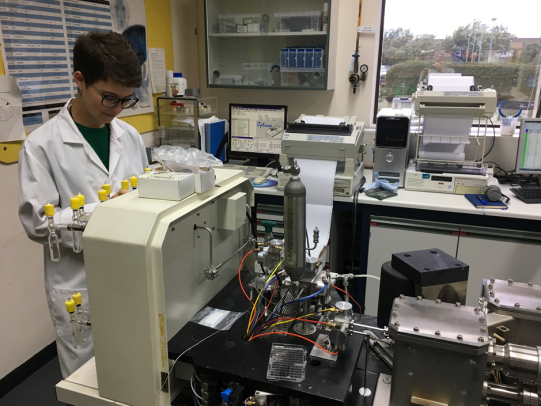 For the first few days, I worked with Chris Kendrick to carry out the steps involved in preparing a carbonate sample for analysis on a mass spectrometer. The sediments we prepared were from a Scottish Loch and we wanted to use them to reconstruct past changes in the Loch’s water chemistry. To prepare the inorganic carbonate from the sediment extracted from the Loch, we first had to weigh out the sample – around 10 milligrams - and put them into small glass vials. The small vials were then dropped into bigger vessels with 4 ml of phosphoric acid inside. Next, they were attached to a vacuum line to remove all the air. After this they were left in a 25°C water bath overnight, the vials then had to be shaken to allow the acid and carbonate to react to produce CO2. Any water was removed from the CO2 using the vacuum line and an acetone water trap. Clean CO2 was then collected using a liquid nitrogen trap. These vials of pure CO2 were attached to the mass spectrometer ready for analysis. The results we collected showed that over time the Loch had become more marine and less influenced by freshwater. This suggests there was a period of sea-level rise. While waiting for the results, I learnt how to weigh out tiny amounts of BGS’s in-house standard for the organic carbon technique – which was actually freeze dried broccoli! I had to learn how to weigh out 0.7–1.5 milligrams of the powder and then fold it into tin buckets in preparation for the mass spectrometer. As if I thought I couldn’t weigh anything smaller, I helped Hilary Sloane by weighing out international (IAEA) standards for another mass spectrometer that required only 50-200 micrograms (about the size of a full stop! ), which is 1000 times smaller than the samples I weighed before earlier in the week! We then analysed the standards and achieved nearly perfect results! On my last day, I learnt about how the isotope lab played a key role in the investigation of Richards III’s skeleton. Using their isotope techniques to examine different parts of the skeleton they were able to identify what Richard III’s diet had consisted of and where in England he lived. I was also given a tour of the BGS geological walk way and the National core store which is filled with drilled cores from across the UK and contains over 500 km of cores and thousands of tonnes of rock. Overall, my week at the BGS was extremely interesting and really opened my eyes to the importance of isotopes in so many research areas of geoscience. I really appreciate all the patience the geoscientists had with me as I learnt about their jobs and completely admire the work they do. I would like to thank Chris Kendrick, Hilary Sloane, Andi Smith, Angela Lamb and Jack Lacey for all helping me throughout the week and providing me with this invaluable experience.